ICON is always searching for the upper hand; we?ve found it with the Hypersport glove. The materials and construction of the Hypersport glove have been purposely chosen for their innate abilities to provide this advantage. It all starts with a French cowhide and kangaroo chassis. 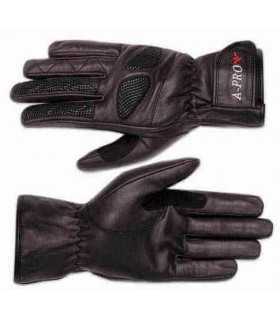 The French cowhide backhand, supple & strong, provides excellent comfort and flexibility. The kangaroo palm, a hallmark of purpose-built track gloves, provides optimum abrasion resistance and dexterity. Additional panels of digital BattleHide? goatskin are located in areas of high wear from grips. The mechanical articulation panels, which run the length of each finger, provide excellent flexibility from the very first wear - no break-in period needed. Key construction techniques include ICON?s exclusive floating knuckle, which allows for maximum knuckle articulation, and an out-seamed finger box for all day comfort. The Hypersport gloves feature full knuckle coverage from the vented TPU/Polycarbonate knuckle plates. A wrist hook & loop closure allows for a secure fit.